My favorite summer pasta, loaded with kitchen garden tomatoes and basil. Last September I shared a recipe for this Pasta with Sun Dried Tomato and Artichoke Pesto, Cherry Tomatoes, and Fresh Basil, which I pretty much lived on for most of that month. I even ate it for breakfast. While mixing up the third or fourth batch of the quick and easy pesto, I took a cue from my favorite basil pesto recipe and tried adding some fresh tomatoes. I loved the results, but never got around to sharing them. So here's the new, slightly thinner version of this scrumptious pesto, which has more tomato flavor and fewer calories. It also gives you about another half cup of pesto. Enjoy it in the original pasta recipe as pictured above (instructions are also below), or simply toss it with pasta and sprinkle with cheese, or spread it on slices of crusty baguette (my Easy Four Hour French Bread Recipe is here), or just eat it with a spoon like I usually do. I'm sure you could use it in all sorts of other ways, too. My original version of the pesto made a scrumptious spread when mixed with cream cheese and some grated Pecorino Romano, and this one probably would, too. Next I'm going to try it on homemade pizza (you'll find my favorite easy pizza crust recipe here). If you're serving this with pasta, you can quickly mix up the pesto while the pasta water boils, or you can make it ahead of time and keep it in the fridge. It tastes even better the next day. For a saucier sauce, simply keep adding more fresh tomatoes until it's the consistency you like. You can also thin it out with a little pasta water. If you don't have oil-packed sun dried tomatoes, you can substitute sun dried tomatoes that have been rehydrated in a little hot water, though you might need to add an extra Tablespoon or two of olive oil to the pesto. When I have an abundance of San Marzano paste/plum tomatoes in the garden, I slice them in half and dry them in my food dehydrator, an extremely handy item that paid for itself with dried tomatoes alone. Combine the artichoke hearts, sun dried tomatoes, Pecorino Romano, and chopped garlic in the bowl of a food processor (I love my KitchenAid 12 cup food processor) and whiz until either smooth or still somewhat chunky, whichever you prefer. I like it best smooth, but it's also nice to have some of the sun dried tomato pieces left. With the machine running, drizzle in the 2 Tablespoons of olive oil, adding more if desired. Add the fresh tomatoes and process until it's the consistency you like. Salt to taste. This pesto will keep in a covered dish in the fridge for several days. The key word here is unmoderation. Apply my More, More, More philosophy with gusto when you make this, because you really can't have too much of anything here—unless of course you devour it all yourself. Place the hot drained pasta in a large bowl. Stir some of the reserved pasta water into the pesto to thin it out, and then toss the pesto with the pasta, along with some of the fresh basil. At this point you can either toss the pasta with lots of cherry tomatoes and more basil, or portion it out and then top each serving with the cherry tomatoes and basil. Either way, be sure to sprinkle plenty of freshly grated Pecorino Romano or Parmesan on top and pass the pepper grinder. 8/18/10: Tomato Season Has Arrived & the First Tiny Harvest is In! © FarmgirlFare.com, the sun drenched foodie farm blog where red and green may have most people thinking of Christmas, but around here they definitely signify summer. That looks so good. I have a lot of basil I need to use, too. A lovely home made red pesto & I only eat home made red or green pestos!! I just got finished eating this dish. SOOO GOOD!! 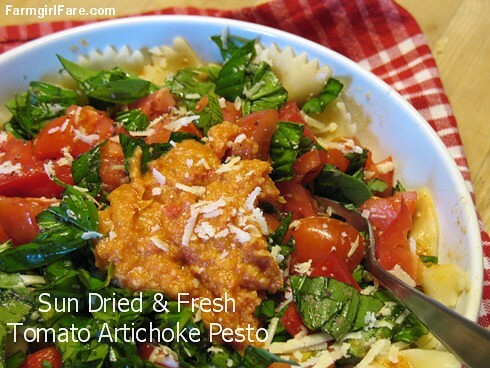 I made this recipe with basil and tomatoes from the local farmers market. This dish was so fresh tasting. All of the flavors go together so well. Now I cannot wait to try your pesto recipe. Thanks for your blog! You really have some wonderful recipes!